Hero Renewables are premium installers of the LG Therma V Air Source Heat Pump, with vast experience in designing these systems for homeowners and businesses alike. 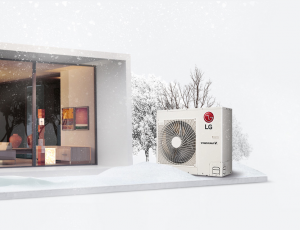 The LG Therma V range of air to water heat pumps have been carefully designed to provide efficient space heating and hot water for almost any application. There are currently three models available, Monobloc, Split and High-Temperature. All units come with an industry leading 7 year warranty, safely securing your investment period from the Renewable Heat Incentive. To Request a quote for your LG Therma V, Contact Us Today. 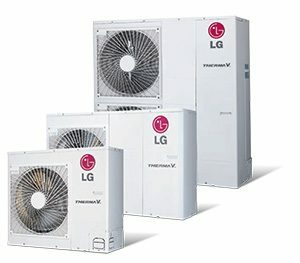 Why choose LG Therma V? Monobloc Air Source Heat Pumps consist of only one external fan unit which consists of a plate heat exchanger, A-Class water pump, back-up heater and expansion vessel. The LG Therma-V range of Monobloc units come in a range of different outputs, varying from 5-16kW on a single or three phase. For older, lesser insulated properties, LG have designed a high temperature split unit capable of reaching 65°C. The output of the high temperature unit measures at 16kW, whilst delivering a Seasonal Coefficient of Performance of 2.25. Separated into two units, the external fan side can be placed up to 10m away from the property, allowing you greater flexibility when choosing a site location.